Preludium, Anglican and Episcopal futures: The RC Anglican Covenant Draft: Review of the Whole. The RC Anglican Covenant Draft: Review of the Whole. For those few who actually want my full review of the Ridley Cambridge Draft Covenant, here it is. I have scored this using flamingo icons...five is best none is worse. Rating for the whole? A miserable one flamingo. This draft is fine as it builds to section two, begins to fail in the first part of section three and is from then on very difficult. If the whole consisted of 1,2 and part one of 3 it would be livable. As it is I don't see how any responsible Church in the Anglican Communion could sign, either tentatively (as is proposed in one resolution) or fully, without a great deal more conversation and trust building. In particular the enhanced role of the Joint Standing Committee of the Primates Meeting and the Anglican Consultative Council, undiscussed by any but the big-wigs, gives it power to recommend to its parent bodies the exclusion of member churches. Some body may have to have that authority, fair enough. But we have not discussed this and I see no way to discuss it in less than several years. And, all the assurances to the contrary, it carries implications for the Constitution and Canons of every member church. The implications may not be about changing the CandC of various Churches, but rather be about the press from outside for conformity to the relational control of the whole. One way or another this is about making churches behave. We need to talk, not sign. Not now. The Review of the RCDC. The Preamble of the(RCDC) speaks of affirmations and commitments. The careful reader will note that Sections one, two and three following this dual track - affirmations, commitments. Section four does not. Otherwise the Preamble is now cleaner and clearer than in the past. In particular it begins, "We, as Churches of the Anglican Communion..." The entities making the covenant are "Churches," by which is meant "National or Regional Churches." What is missing throughout the document is a clear definition of just what is meant by various words, among them "Churches." Unless otherwise noted my sense is that "Churches," is meant such National or Regional Churches with synods, houses of bishops, at least three dioceses, and a form of internal governance. Assuming this as the meaning of this use, I give the Preamble four flamingos. Section One: Our Inheritance of Faith. (1.1.2) All the thumping about about the "historic formularies of the Church of England" have now been recast as an affirmation that they "bear authentic witness to this faith." They are thus reduced in status as compared with the Holy Scriptures and the Catholic creeds. This is a good move. (1.1.3-6) These are the elements of the Lambeth Quadrilateral simply lifted into the Text. Who can quarrel? I do find the Chicago version of several sections better - "The Holy Scripture of the Old and New Testament as the revealed Word of God." The statement "The Holy Scripture of the Old and New Testaments, as containing all things necessary to salvation," and as being the rule and ultimate standard of faith" takes an entirely different slant on just what sort of instrument the Holy Scripture is. I'm for the revealed Word of God, more than the limit, rule or standard of faith. Likewise, I prefer the Chicago statement on the creed, which simply says, "The Nicene Creed as the sufficient statement of the Christian Faith," rather than "The Apostles' Creed, as the Baptismal Symbol; and the Nicene Creed, as the sufficient statement of the Christian faith." The last two sections are identical. But this is all old water under the bridge. (1.1.7) concerning common prayer and liturgy, and (1.1.8) the apostolic mission of he whole people of God, are very good additions to the Quadrilateral, which I suppose will become the Lambeth Hexagon. This section (1.1) is sound and pretty much sums up the Anglican take on the received faith. I would have given it the coveted five flamingo rating, but really wish they had stuck with the Chicago text. So four. The pacing here takes a turn. Until this point the Holy Scripture has been mentioned in the Draft Text itself three times. Now in 1.2 speaks five times of Scripture. The whole of section one concerns "Our Inheritance of Faith" and there is no question that the Holy Scriptures of the Old and New Testament is central to that inheritance. The Word of God, however, is not a product of the Scriptures but also (or most particularly) the source by which the writings are indeed Holy Scripture. The commitments made in this section, related to our inheritance of Faith, make it appear that what we are dealing with in our "varying contexts" is our understanding of Scripture. It is not. What we have in this Faith, reliant on the Holy Spirit, is the presence of the Word of God, that Word being present from the beginning with God and known in Jesus Christ. The Scriptures are instruments of that Word, not the Word itself. Perhaps I have put this poorly. No matter. The reader will understand my concern: This section, which deals with the Faith received, says not one word about The Word of God. It speaks on two occasions of "Scriptures as God's Word," and "what we have received from God's Word." But our faith is not here in any way directly related to The Word, which was with God and was God, that is the source of all creation. This section is the product of a very different hand than either the Introduction to the Text or Section 1.1. As to the matters to which it commits us, should a church sign off on the Covenant, there is nothing to which we as Christians could not be honorably committed. There is a note of stringent control in (1.2.1) "mindful of the common councils of the Communion and our ecumenical agreements," (1.2.2) "answerable to the teaching of Holy Scripture and the catholic tradition." Those might be construed lightly. The stress in 1.2.7-8 on Eucharist and common pilgrimage are commendable. Section 1.2 is oddly written and falls short of expressing the fullness of the Faith that is reliant on the Word of God. It is not convincing, but it is not terrible either. I give it three flamingos. "Communion is a gift," the RCDC says, and indeed it is. There is nothing in the ordering of this section, however, that says anything about the ANGLICAN communion being that gift of communion. But we kind of know what the writers mean. They mean that being in the Anglican Communion the gift of communion is realized, in spite of our being miserable sinners, etc. They are right in that, although it is hard to tell just how or why from this section. This section speaks of the "work of establishing God's reign." I think that is hokum. God's reign has been established, is established and will be established by God's own presence, not by our work. But again, I know what they mean: Knowing that God reigns and not Caesar, maybe we would do well to act like it. Section 2.1 is a dud. The affirmations are, if valuable, deeper than these words. These words are not much of an affirmation one way or another. 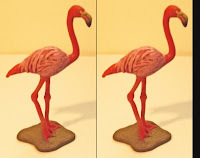 One flamingo. The major commitments of this section are the "five marks of mission" which came from the Missio Report of 1999. (see footnote 9 in the text). These are reported out in 2.2.2.a-e. The commitments section is fine. I note the continuing need to commit with our shortcomings always before us. 2.2.3 "openness to our own ongoing conversion in the face of our unfaithfulness and failures in witness." Even in the midst of commitments we just can't bear not mentioning our sins. I give this a five, solid and worthy of commitment. It goes well with 1.2, the Lambeth Hexagonal. The whole of section 2 is a bit of a mishmash, written in several voices. But on the whole OK. Section 2.1 could be struck with nothing lost, but then the rhythm would be broken. So the whole gets four flamingos. Section 3, Unity and Common Life. This section begins with an affirmation of Baptism and Eucharist as the basis of being part of the body of Christ and for working to be together. Quickly, however, (3.1.2) matters turn to the episcopal character of the way we work together. Here the Anglican Communion is viewed as a "Communion of Churches," and "churches" here mean a collection of dioceses in synod. "Each Church, with its bishops in synod..." All seems well until the last sentence, " Churches of the Anglican communion are bound together "not by a central legislative and executive authority, but by mutual loyalty sustained through the common counsel of the bishops in conference," and of the other instruments of Communion." The "instruments of Communion" get in the door by way of "bishops in conference" by which is meant, of course, the Lambeth Conference. It is, then bishops who are the basic structural link that makes the Anglican Communion a covenanted community. It is their mutual loyalty that is viewed as the basic linkage that are at the core of the "Instruments of Communion by which our Churches are enabled to be conformed together to the mind of Christ." 3.1.3 Continues the affirmation of the central role of bishops in the Anglican Communion, this time affirming the "historic threefold ministry of bishops, priests and deacons." It is they who "call all the baptized into the mission of Christ." The laity are called by the ordained into the mission. Here the notion that mission is to the Mission of God and, as understood as the Mission of God in Jesus Christ, is the purview of the whole people of God falls away. Baptism as the context for call to mission is not mentioned. 3.1.4 Spells out a set of affirmations related to the Instruments of Communion. We are called on to affirm their importance. They are seen as a way of discerning our common life and mission from episcopal synod to local witness. They are the familiar four: The Archbishop of Canterbury, the Lambeth Conferences, The Anglican Consultative Council, The Primates Meeting. Much has been said about these Instruments and this section at least may be credited with trying to sort out matters of authority and function. But there are some pitfalls. (I) The Archbishop of Canterbury "gathers ad works with the Lambeth Conference and the Primates Meeting, and presides in the Anglican Consultative Council. Note "gathers and works with" in relation to Lambeth and the Primates. There is no sense here that he determines who is invited or presides. This is a bit of a step down from current practice. When the argument comes for electing the chair of the Primates Meeting or the one presiding and guiding the Lambeth gatherings, there will be no help from this Covenant. (II) the Lambeth Conference and (III) The Anglican Consultative Council are true to the realities. The ACC description is pretty lame, given that the ACC is the driving force behind very good and important work done in the Communion, and in particular the support of various networks of interest. (IV) "The Primates Meeting is convened by the Archbishop of Canterbury." Here what was not affirmed by (I) is at least recognized as a fact on the ground. The matter of the PM authority is grounded in the authority each Primate brings as head of church. They are described as "representatives of their Provinces." ("Provinces" replaces the word "Churches" here.) As "representatives" it could be argued that they are empowered thereby to vote on matters in the name of their churches, subject to the authority granted them by their own synods. Here an interesting problem arises: several churches, those with Moderators and some with Presiding Bishops, do not grant their heads of church the Metropolitical authority to commit their churches to particular actions or positions. They are therefore not representatives empowered to commit their churches. It may be that none of the Primates have such power, but the matter of representation raises a concern about the decision making possibilities of the Primates. The last paragraph of this section is the lead in to the matters that will be discussed in section 4. The instruments are all meant to support one another, and any may "initiate and commend a process of discernment and direction for the Communion and its Churches." This is of course the source of power granted the instruments, and affirmation of this section is an affirmation for the instruments to conduct hearings, investigations, etc, at will. This section which spells out the functions of the Instruments of Communion, would have been a no-brainer, but the very clear stress on unity as a matter of the episcopacy and the jump from there to the authority of the Instruments of Communion as an extension of the centrality of episcopacy, is a reach. The conclusion of the affirmations is to affirm the notion that any of the instruments can initiate and commend, etc. I give this section only two flamingos. The affirmations will require considerable clarification if they are to be made at all. 3.2.1 We have to commit to "have regard for the common good of the Communion in the exercise of autonomy," meaning that we ought not exercise it under certain circumstances, pay for the work of the Instruments of Communion, and pay attention to their work and counsel, and accommodate their recommendations, i.e. we commit to giving up autonomy for the common good, period. 3.2.3 The commitment to spend time in discernment is the "teeth" to the notion of moratoria. They are instituted in order to give time for discussion and discernment. (See the Windsor Continuation Group Report.) So in committing to spending time we would be committing to the requests for moratoria when made by any Instrument of Communion. 3.2.4 The commitment to seek a shared mind with other Churches again is a commitment to holding back, to "gracious restraint," based on the possible inconsistencies in understanding of "Scripture, common standards of faith, and canon laws of our churches." Here for the first time the matter of "regard" is extended to the Instruments and Commissions of the Communion. The Commissions would include, for example, the Lambeth Commission on Communion which produced the Windsor Report. That Report has become an idol by not too easily justified political processes within the Primates Meetings, by what is spoken of as unanimous consent, being part of various communiques of the Primates Meetings. 3.2.5 calls for the commitment to "act with diligence, care and caution." This is the call to prudence, which unfortunately trumps compassion or prophetic action at every turn. This is the life for the Church and death for faithful living. 3.2.6 commits the churches to mediation and opens the door to the commitment to Primatial Visitations. 3.2.7 commits to holding the "highest degree of communion possible." It tells us nothing about what that means. This section reflects the Windsor Continuation Group's work and opens out to commitments to include many of its recommendations. For this reason agreement to the Anglican Covenant now embroils us in the recommendations of the WCG's paper, which paper is not part of the Covenant. This is a Trojan horse. This section commits the churches to moratoria, prudence, mediation and measured process. It does not commit any church to respect the uneven processes as a challenge to new life, although in 3.2.3 there is an observations that "Some issues, which are perceived as controversial or new when they arise, may well evoke a deeper understanding of the implications of God's revelation to us..." There is nothing that commits us in any way to this observation. This section gets NO flamingos. If this section of commitments were in place, the ordination of women to the priesthood would not have occurred thirty years ago, there would be no women bishops and it would be inconceivable that there would be a woman as Primate. Comment on style: Each section has had two parts, a first on affirmations and a second on commitments. Section four breaks with this pattern. Here there are a set of statements that are affirmations and commitments, one or the other or both. 4.1 Adoption of the Covenant. 4.1.1 The Covenant is understood to involve commitment "in submission to God" but not submission to "any external ecclesiastical jurisdiction." At first this appears to allay the fears of those who believed that earlier drafts of the Covenant would require changes in our Constitution or Canons. The fears remain, however. The Covenant shifts the matter of submission to God rather than to a higher level of law. No longer is the relationship among the member churches a matter of agreed on rules, expectations, hopes, binding laws, etc. We need to look very carefully at the statement, "Each Church adopting this Covenant affirms that it enters into the COvenant as a commitment to relationship in submission to God." 4.1.2 Each church "recognizes these elements (the prior sections of the covenant) as fundamental to the life of the Anglican Communion and to the relationships among the covenanting Churches." To the contrary, only some of the elements of the proceeding sections are fundamental (the Lambeth 4 or 6, and the Five Marks of Mission.). This section is a catch all clause. 4.1.3 "Under terms of this Covenant no one Church, nor any agency of the Communion, can exercise control or direction over the internal life of any other covenanted Church." Again this is an answer to concerns about autonomy remaining from the previous draft. Having established the covenant as relational as concerns submission to God it now notes that "Recognition of, and fidelity to, the text of this Covenant, enables mutual recognition and communion." Nothing suggests that such mutual recognition and communion requires this recognition and fidelity, but the suggestion is certainly just below the surface. 4.1.4 Every Church in the Anglican Communion, as defined by the Anglican Consultative Council is invited to adopt the Covenant. Such adoption assumes 4.1.3 the wholesale affirmation of the whole Covenant. Here the Churches of the Anglican Communion are those recognized by the ACC. The suggestion that this draft does not support the notion that dioceses can sign up. 4.1.5 Here, however, "Churches" has another possible meaning. "It shall be open to other Churches to adopt the Covenant." This opens a whole world of complex weavings, not the least of which is the notion that any one of the Instruments of Communion might independently recognize a "church" and that a church can request formal recognition and membership in the body of a particular instrument. You could end up with a diocese recognized by the Archbishop of Canterbury as "extra-Provincial," and not by the Primates some of whom would view the diocese as logically related to their own jurisdictions. Or suppose a majority of the Primates recognized a collection of bishops and religious communities in the US as having signed on as members of the Anglican Communion contrary to what the ACC decides. This is a mess. 4.1.6 "This Covenant becomes active for a Church when that Church adopts the Covenant." What in the world does this mean? Surely not that that Church (Province, regional or national church, group of dioceses, individual diocese, whatever) is part of the Anglican Communion by being party to the Anglican Covenant? The Covenant begins by saying, "We, as Churches of the Anglican Communion..." The assumption is that the covenant is among churches already part of the Anglican Communion, or perhaps brought in under 4.1.5. Probably 4.1.6 means "This Covenant becomes active for a Church of the Anglican Communion...or just possibly it becomes active for a Church intending union with the churches of the Anglican Communion. Relationally it the Covenant is active for a Church when it adopts the Covenant, of course, but that opens up all sorts of problems when the other persons (churches) in the covenant community don't appreciate or want that additional group. This relational business is fine until we get to the fine points of sharing the same bed. As a Covenant of the Anglican Communion it would seem to me the Covenant would become "active" when a certain percentage of the existing members of the Communion buy on. Suppose 4.1.6 were to read, "This Covenant becomes active for the Anglican Communion when 4/5 of the member churches adopt it." At least that would make it a covenant of the Anglican Communion and not a warm fuzzy relational thing that holds just because a church buys on. I give this section (4.1) one flamingo. 4.2.1 Things get really strange now. The Joint Standing Committee of the Anglican Consultative Council and the Primates' Meeting or any body that succeeds it takes on oversight, with the power to appoint and nominate committees and commissions for investigation, visitations, etc. The shall have the duty of overseeing the functioning of the Covenant..." (emphasis mine). Suddenly the JSC. JSC has not played a part in the Covenant until this point and now, in 4.2 to 4.4 the Joint Standing Committee appears ten times. The sudden introduction of the JSC is very much in line with the Windsor Continuation Group, but at no point is the Windsor Continuation Group recommendations referenced in this section. This is the smoking gun of un-admitted control. If there are grounds for suspicion this is it. 4.2.2 JSC can request a covenanting Church to defer action, and appoint committees on relational consequences. 4.2.3 JSC can recommend to any Instrument of Communion relational consequences, limitations of participation, or suspension. 4.2.4 JSC may make declarations concerning incompatibility with the Covenant, although supposedly these do "not have any force in the Constitution and Canons of any covenanting Church unless or until it is received by the canonical proceedures of the Church in question." Meaning, I suppose that the JSC could declare the actions of TEC incompatible with the Covenant and request that there be a change in the canons of TEC. They could not force the change, but may recommend that the consequences spelled out in 4.2.3 be made permanent. 4.2.5 is the basis for JSC recommendation for anathema, exclusion, expulsion, etc. 4.2.6 requests each covenanting church to put in its own Canons and Constitution a relational function to the Instruments of Communion and the recommendations from it (provided one supposes by the JSC.) 4.2.7 Oddly here "participation in all of the above is limited to members of the Instruments of Communion who are representative of those churches who have adopted the Covenant or who are in the process of adoption." What does that mean? Does this mean that provisional members (from a church in process) might be included in membership of a body that receives the recommendation to cast out this or that church? 4.2 sets out the long suspected star chamber. The Joint Standing Committee is by election from the Primates and the ACC. That membership is derived by absolute raw power at its worse, or at its best by prayerful consideration of balance, viewpoint, place in orders, laity, etc. In all likelihood is is the product of a mixed experience of political action and prayerful consideration. It is, in other words, a matter of ecclesial politics, subject to the power of words and potentates, but less clearly subject to the Word of God, by which I don't mean the Scriptures but the presence of God, known in Jesus Christ, in the lives of people and in all creation. It is a bureaucratic mess. Worse, it is the imposition of a fifth instrument, born out of time, the product of the ACC and the Primates Meeting as envisioned by the writers of the Windsor Report and the follow-up Windsor Continuation Group. Without further explanation and careful codification this section is dead in the water. No flamingos flying here. 4.3 Withdrawal. Sure. If a Church withdraws there are questions as to why. Supposedly one could withdraw from the Covenant but not from the Communion. But if the Communion is identified and defined by the Covenant, withdrawal from the Covenant IS withdrawal from the Communion. So the relational catch 22 is now complete. This thing is about submission to God by way of relationship. Mess with the relationship by withdrawal, and the willingness to submit to God will be challenged. There is no free leaving. Leaving is to leave the communion commanded by God, etc. This section is a half mess. I'll save the flamingo for later. 4.4. The Covenant Text and amendment. Well, if it ever gets this far, the JSC gets to screen amendments. The text is the received text and the Introduction is what it is... an official unofficial absolutely to be included extra thing attached to the Covenant. We just don't have to argue about its wording. Oh well. Our Declaration One supposes that we can be "partakers in this Anglican Communion Covenant" just as we are partakers in this Holy Communion" but the language is just plain silly. The Anglican Communion Covenant is not the basis of communion. Inclusion in the body of Christ is. At the very least we are not here to eat this or that bit or piece of the Covenant. We are not partakers, we are making contract, swear, promise, etc. We do not come here to eat. We come to become one with one another. That is perhaps a slightly different task. The whole of section 4 and the "Our Declaration" is a bureaucratic use of relational language to produce a star chamber of persons who will enforce the Windsor Covenant and related insistence on the three moratoria, and maybe a fourth, and essentially weed out over time any church that does not comply with the requests that they not act, do or undertake anything that is beyond the existing norms of the Communion, as defined by such things as Lambeth statements, Windsor Reports, etc. This is a particularly difficult section of the Anglican Covenant and I see no way to sign on with new machinery and processes in place that have not been adequately discussed. The whole thing gets a "no flamingo." I like the Flaming Flamingos motif. We do need more humor and less finger pointing. I guess that one person's flamingos are another's flaming flamingos. They are just being flamingos Blue, like those of us who are queer, are just being queer. Granted, there are some flaming queers! Thanks for the thorough and thoughtful analysis, Mark+. Thus, we have a huge number of possibilities of degrees Anglican-ness: There are those provinces, have signed on to the Covenant, have not been disciplined in any fashion and are thus full participants in all the instruments of unity, and they don't invent baptismal texts denying the fall, etc. They would be Anglican on all accounts. But you could have provinces that had signed on but then had been excluded from the ACC, say. You could have "Anglican" non-provinces that signed onto the Covenant, e.g., the ACNA or the Episcopal Church in the Philippines. Then you could have Covenant-signing individual dioceses of non-signing provinces. Finally, you could have non-Anglican entities which have signed the Covenant (e.g., the SBC). What continues to amaze me is the use of "raw power" couched in religious traditions, language, and acts. It is like spiritual isogesis. Most offensive to me is the idea of defining unity as universal assent to all shared principles. As if unity can only be found in identical positions. The beauty of unity comes from not only embracing difference, but sometimes opposing positions. To use a warring nation metaphor, we must look no further than the Israel/Egypt peace process. The lasting peace between these two nations reveals not unity through universally-adhered-to principles, but in choosing to stand united in the face of that difference. Ditto the no flamingos. Miss Pink Flamingo, on my front porch, dressed in her Easter Bunny Outfit agrees that she would leave town if this covenant got any flamingos. 500 days off purgatory to the person who can make something out of that. I see actually fewer flamingos than you and I just love the dang birds. Given the "fly" motive, I would suggest a raven for certain sections, and a dove for others. Me no likey the cov given it is not a cov it is a doctrinal, vertical list of qualifying questions dressed in a mess of words designed to harass and eliminate. I dunno, maybe better put, it is really a spiritual bomb. Mark, I salute you for the care you have put into this analysis. Thanks for doing this hard work. Mark, I do admire your critical analysis of the draft covenant, and the sections which cause you greatest degree of difficutly are telling of the whole problem of unity in the church - thus I am still wondering about the futility of the whole endeavour to arrive at a covenant when some provinces are not willing to affirm the 39 Articles and are willing to ordain clergy and consecrate bishops with their fingers crossed at the saying of the creeds, and have made significant revisions to the prayer book without reference to the whole communion. A covenant that is worth anything is simply going to be ignored by self willed, self centred provinces, whereas a covenant that is worth anything really cannot be ignored for the sake of unity of the whole communion. Unless the paper this "covenant" is written on is soft and absorbent, it isn't worth anything, nor is any covenant that tries to kill our conscience to placate the backward. At its best, it's an attempt to circumvent the national churches and make a new Rome out of what was never anything but a vanity piece for the US and Britain.